Greetings from the other side! The side of glittery christmas trees, whimsical stockings and snowflake coasters galore! <— No but really, you don’t even want to know how many there are currently strewn across our house. What can I say, we take our christmas decorations pretty seriously around these parts (and by we, I mean me). ANYWAY. Before we move on to holiday baking central (!! ), I thought that we should first chat about a sort of re-set meal, if you will. One for after all that thanksgiving feasting … and one to prepare for the onslaught of all them cookies! Plus, it seems to be tradition that I share a cozy soup right after turkey day. Last year there was this slow cooker thai sweet potato soup (major favorite at our house!) … and two years ago there was this slow cooker vegetarian tortilla soup. So today, we continue with our third annual soup-a-palooza and chat this turmeric quinoa vegetable soup! How many more times do you think I can say soup??? Now, I am going rogue and cooking this recipe on the stovetop instead of in the crockpot, but I can assure you that it is still easy as can be. Just about 15 minutes of prep and you’re off to the races. A little bit of stirring and simmering and you’ll wind up with a dish that is light, fresh and filled with flavorful spices. There’s some creamy dreamy coconut milk, a ton of colorful veggies and not to mention both quinoa and chickpeas for some protein. It’ll fill you up without weighing you down … so you have plenty of energy to dish out all that festive goodness. There are treats to be baked, gifts to be bought, movies to be watched! Oh christmas, you sure are fun. Let’s talk spice! This soup definitely has some kick as written from the cayenne pepper. So if you don’t like spicy foods, either decrease the amount or just leave it out entirely. I would encourage you to stick with the ⅓ cup quinoa and not try to add any more! I tested it several times with a higher amount and the soup gets way too thick. Along those lines, I’d also encourage you to stick with light coconut milk. It helps keep the broth more, well, broth–y! And finally, feel free to play around a bit with the veggies. Use a red onion instead of a regular onion. Use a different colored bell pepper. Or even cauliflower instead of the broccoli! Just be sure to stick with veggies that will cook in about the same amount of time. Serving up a big bowl of healthy goodness! And now, I’d like a cookie please and thank you. 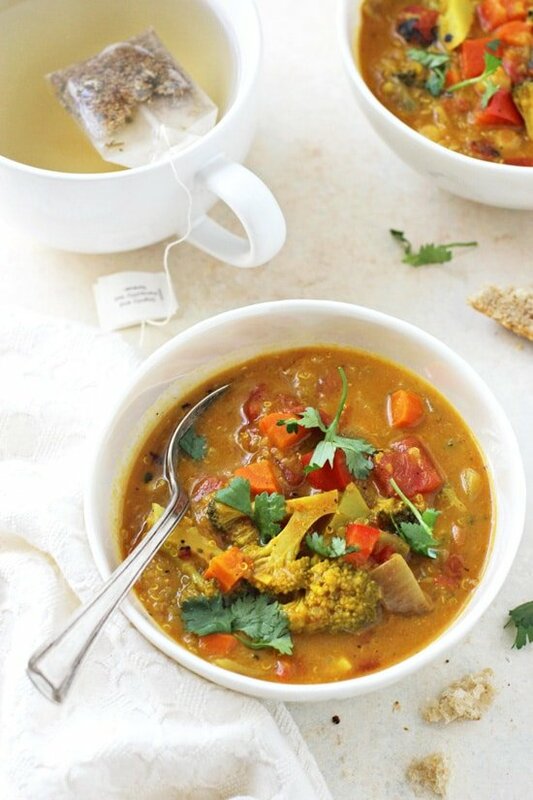 This easy turmeric quinoa vegetable soup is super comforting and cozy! Filled with flavorful spices, colorful veggies, chickpeas and coconut milk! Add the olive oil to a large stockpot or dutch oven set over medium heat. When hot, add in the onion and cook for about 5 minutes, until tender. Stir in the garlic, ginger, turmeric and cumin and cook for 30 seconds to 1 minute, until fragrant and toasted. Add in the carrots, bell pepper, broccoli, tomatoes (with their juices), coconut milk, broth, quinoa, chickpeas, salt, pepper and cayenne and stir to combine. Increase the heat and bring the mixture just to a boil. Reduce the heat and simmer, stirring occasionally, for about 20 to 25 minutes, until the veggies and quinoa are tender. Remove from the heat. Taste and season with additional salt as desired (I usually add about ¼ teaspoon or so more). 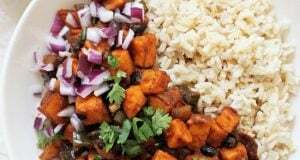 Spoon into bowls and serve garnished with some fresh cilantro! I tend to eat heavy meals this time of year. This soup looks like a good change. It looks hearty, healthy and delicious! Definitely what I need right about now! I love the idea of a reset meal before the new big pig out haha! This soup looks like the perfect way to do that! We’re waiting to put our tree up this year and I’m getting so antsy! I love Christmas decorations and bet your house looks great! This soup is just what I need after last week. I didn’t go overboard but it was still more than usual…and cookie baking is coming! I love all the veggies you’ve packed in here with the hearty quinoa and cozy spices. I need to add this to my meal plan! I definitely take my Christmas decorating seriously too…it’s hard not to when it’s such a magical time of year! Loving the flavors of this soup, Ashley! It’s getting cold here, so I want to eat soup all day, everyday! I so agree! It makes the house feel just so warm and cozy! Thanks Gayle! I love all the spices you packed into this beautiful veggie soup, Ashley! I’ll bet it’s SUPER packed with flavor. And I’m always down for ANY soup that has quinoa in it so this is right up my alley! Me too! There’s something so magical about it! This soup looks so cozy and delicious! I just had a turmeric curry for dinner and the flavor is so perfect for colder weather. I need to make this soon! I love Christmastime, too! We made pizza last weekend while trimming the tree but I should have had this soup. 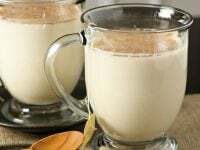 Great idea to reset with something nutritious like this and a great thing to make extra and have on hand so you eat something filling and healthy before hitting the holiday treats and whatnot. All about balance! Enjoy the season, Ashley! Looks delicious! I will definitely make this soup ASAP! Wish I were holding one bowl of this goodness! Turmeric, quinoa and veggies..all my favourites!